From the picture above, UKSG looks like any other conference. Yet it remains something of an oddball, the odd man out of conferences. 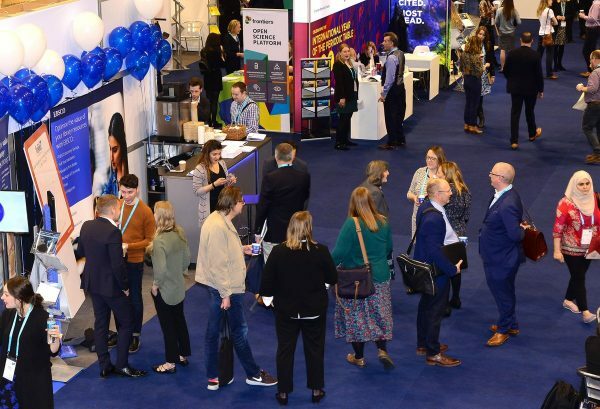 It is a large event – several hundred attendees, which means it is always held in a large-scale venue that is usually uninspired, and this year, the International Centre in Telford, was no exception. A further distinction is that this is the only UK conference, to the best of my knowledge, that has a large number of librarians. There is therefore the opportunity to create a dialogue. Unfortunately, and perhaps unavoidably, it tends to retreat into two worlds: the publishers talk to publishers, and the librarians talk to librarians. As for researchers, they are barely present at all – but that’s true of most academic publishing conferences. So what makes UKSG distinctive? Perhaps most of all the feeling that there is a team of volunteers behind it, an endearing feeling that these people have given up their time to make the event happen – all this is quite appealing, and a world away from National Trust volunteers. Plus, there is a lack of pretentiousnes. This is not a conference for leading experts, flying in for one presentation and then disappearing; the speakers, the participants, and the committee, are all available, and happy to chat. UKSG is also known for some less common initiatives. The quiz night, for example, and the disco following the annual dinner, are both attempts to mix things up a little. You don’t get this sort of thing at the annual STM or SSP conferences in the USA. Of course, if you were uncharitable, you could say that all conferences are only really about personal contacts, about meeting people, and selling and buying (if you are that way inclined). Perhaps UKSG is endearing because, unlike the Frankfurt Book Fair, it isn’t only about buying and selling; the presence of librarians makes the difference. Librarians buy stuff, of course, but they certainly don’t attend UKSG expecting to buy anything; they want to learn something. Librarians attending UKSG are a bit like the tourists who visit Cambridge or Florence. It is a superior kind of tourism, in the expectation that you might have learned something new, or even, perhaps, be a better person at the end of it. How can a conference deal with a thirst, not for knowledge, but perhaps for a combination of inspiration about new ideas, of reassurance that others experience the same problems, and to learn about ways of dealing with challenges that may at first sight have no simple solution. So there were plenary sessions on Plan S, on inequality in the library sector, and so on – all very worthwhile. But for me the real value is in the breakout sessions. This conference has the most complex organisation of any conference I know, with four strands of breakout sessions, each repeated twice, during the three days of the conference. At certain times of the day, the conference descended into chaos as several hundred attendees tried to locate one of ten or more small rooms where their chosen event was taking place. Having found the correct room, the next and more important problem is that the quality of these events was wildly variable. The title of the talk may not correspond with what is actually presented. Several of the presenters did little more than read from a script, or even worse, read out the bullet points from a PowerPoint presentation. I learned more interesting things about COUNTER release 5 from a library blog than I did from the UKSG presentation, which simply repeated some of the official guidance. I would have enjoyed more case studies, and more insight from the presenter, saying what they had been able to discover using this tool. UKSG makes an effort. There are a number of “lightning talks”, where the speaker is allowed just ten minutes. These talks, however, have no time for any questions, so they usually fail to ignite the audience. In the time available, they are reduced to a product pitch or a description of an initiative without any reason why we should be hearing about it. So a good initiative, but little impact. Was there a highlight? Not for me the disco, I’m sorry to say. I thought the best parts of the conference were the break-out sessions, often presentations by librarians who had discovered some way of identifying a new insight from the materials available. For example, Julie Cleverley of Leeds Beckett University described a fascinating project to unit COUNTER stats with individual student log-ins. After making sure they were compliant with GDPR, the team were able to draw some fascinating insights, for example comparing how undergraduate students access (or don’t access) e-resources in each year of their three-year course. Usage was lowest in the second year, perhaps unsurprisingly, but for me, coming from a large university press that was not able to say anything meaningful about institutional usage beyond “we have X hundred users from institution Y”, this kind of information would be invaluable. The presentation was all the more credible when Ms Cleverley revealed they had done the project using little more than a primitive Excel spreadsheet.